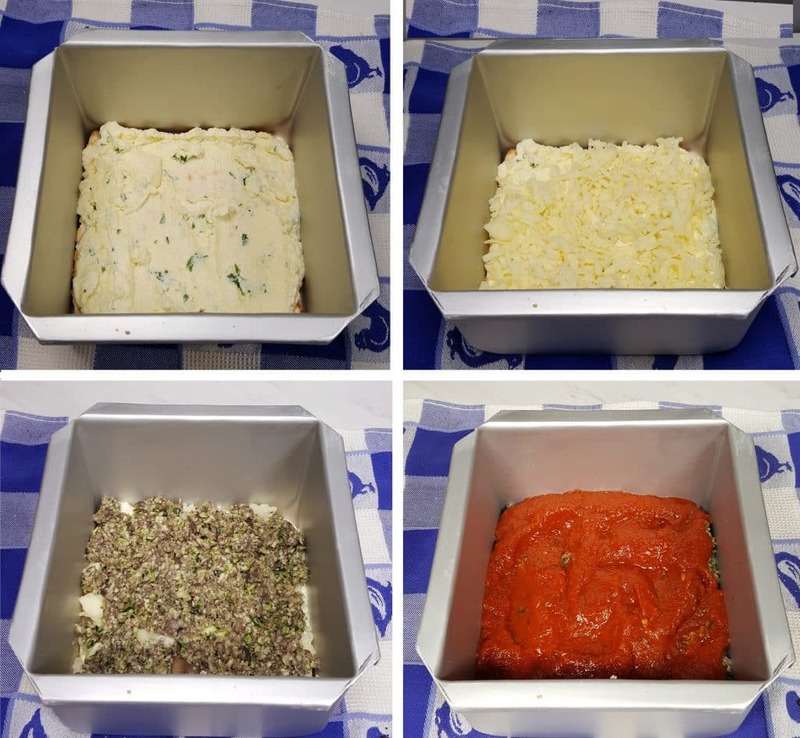 When you want Lasagna during Passover, Pressure Cooker Passover Vegetable Matzo Lasagna is a perfect vegetarian dairy meal. How many times to you crave Lasagna, but it’s Passover and it’s a no-no? Well, now you can have your unleavened cake and eat it too! I know, this Pressure Cooker Passover Vegetable Matzo Lasagna sounds really odd, I mean, Matzo, in a Pressure Cooker, but yeah, it is delicious, I promise. Leavened products, known as “Chametz,” are not to be eaten during Passover. Some examples of Chametz are Barley, Wheat and Oats. But, but, I want Lasagna and it needs to be Kosher for Passover. Start with Kosher for Passover Matzo and keep it Vegetarian. Pretty simple. Obviously, you know the rest, if you are Orthodox, use a separate Pressure Cooker, etc. 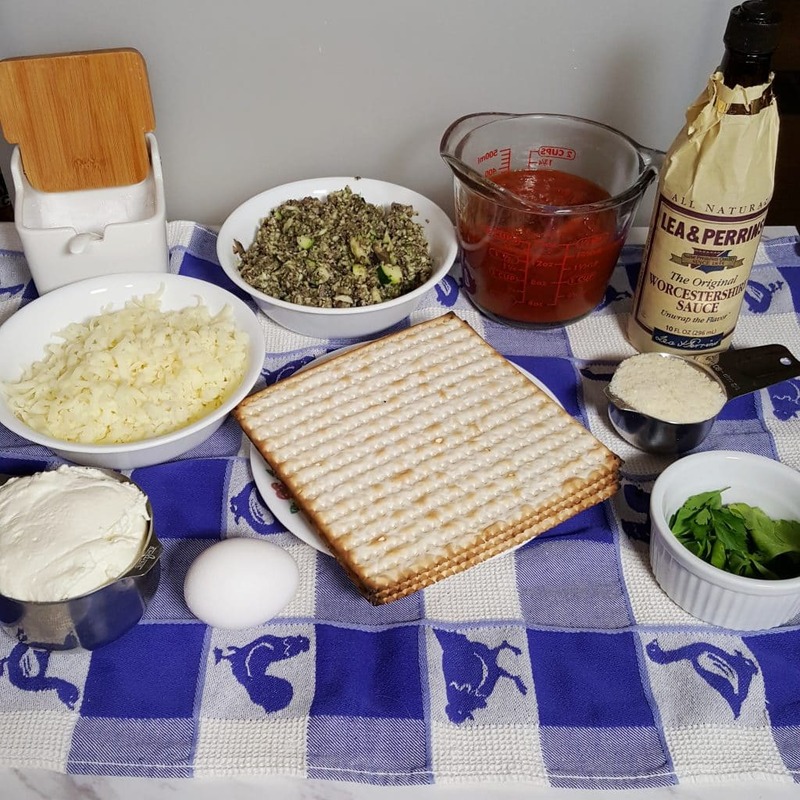 If you don’t keep strictly Kosher, but do abide by the elimination of Chametz, your box of Matzo doesn’t have to be labeled “Kosher for Passover.” You don’t even have to wait until Passover to try make this Lasagna. See that weird looking stuff in the back there? It is a Mushroom/Zucchini Mince. It will give your Pressure Cooker Passover Vegetable Matzo Lasagna a substantial bite/almost meaty feeling. You will need about three cups of my Homemade Pasta Sauce, obviously without the meat option. If you don’t feel like making Sauce, try a jar of this Ragu Thick and Hearty Sauce, as it is one of the better tasting jarred sauces, in my opinion, of course. 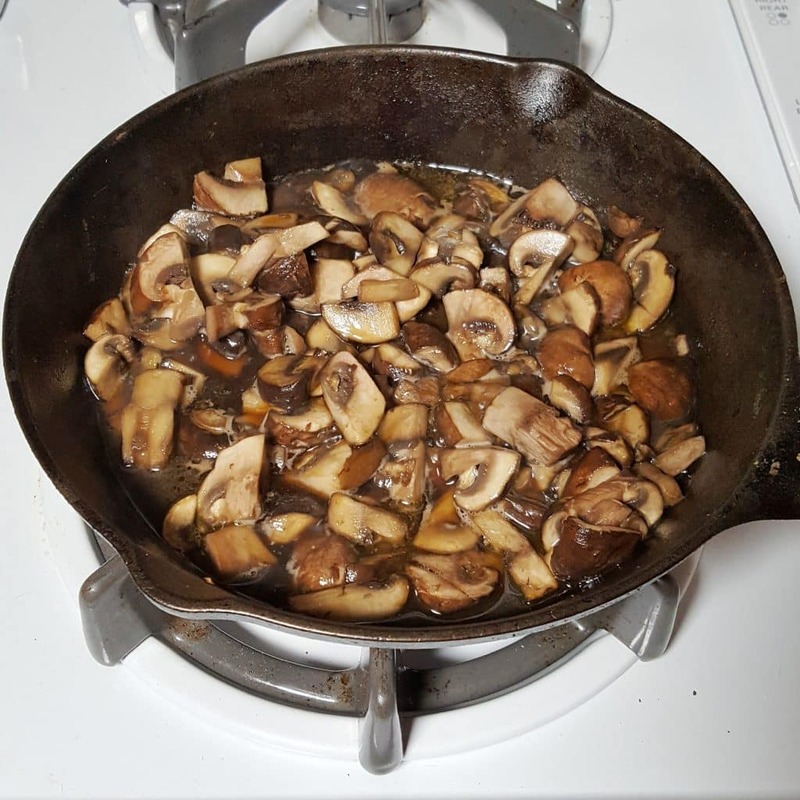 In a Skillet, Sauté Mushrooms in Olive Oil, a bit of Worcestershire Sauce and use a touch of Sherry Wine or Shaoxing Wine, if you like. 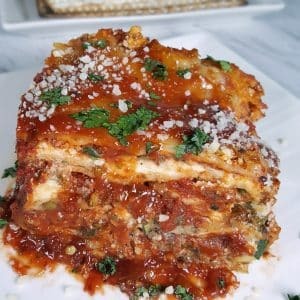 The Worcestershire Sauce and Crimini Mushrooms give the Pressure Cooker Passover Vegetable Matzo Lasagna an almost meaty bite. Crimini Mushrooms are what I use the most in my cooking. They are also known as Baby Bellas, little Portobellas. Portobellas are known for their meaty taste. Plain White Button Mushrooms, to me, have no taste or use, really. After you have Sautéed the Mushrooms, drain the liquid and add them to the bowl of a Food Processor. Process until chunky. Chop up the raw Zucchini and add it to the Mushroom Mince. Process a bit more. Careful not to process too much, as you don’t want mush! The Mushrooms should be in smaller pieces, like cooked ground beef, while the Zucchini should be chunky. Mix together the Cheese Filling. 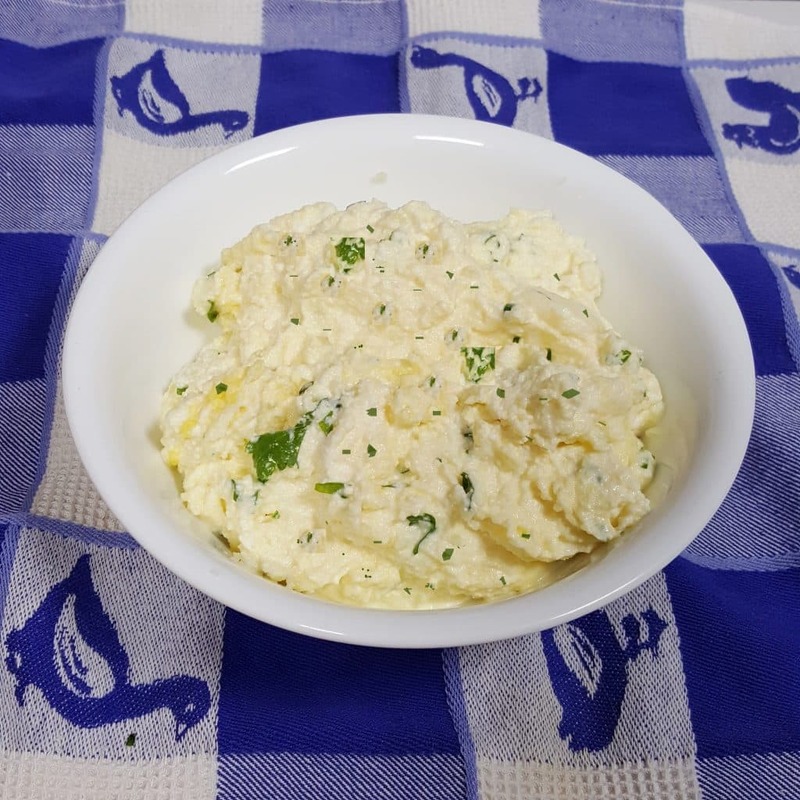 Ricotta Cheese and Homemade Cottage Cheese both work well, so use whichever you prefer. If using my Homemade Ricotta Cheese Recipe, make sure to drain all the water from the Cheese. Fresh Parsley and Dried Parsley also both work well. Grate some good Asiago or Parmesan Cheese and add it to the Cheese Filling. If you don’t keep Kosher, the Powdered Stuff will work. but it is always better to use the real stuff. Place One Matzo into your Lasagna Pan. 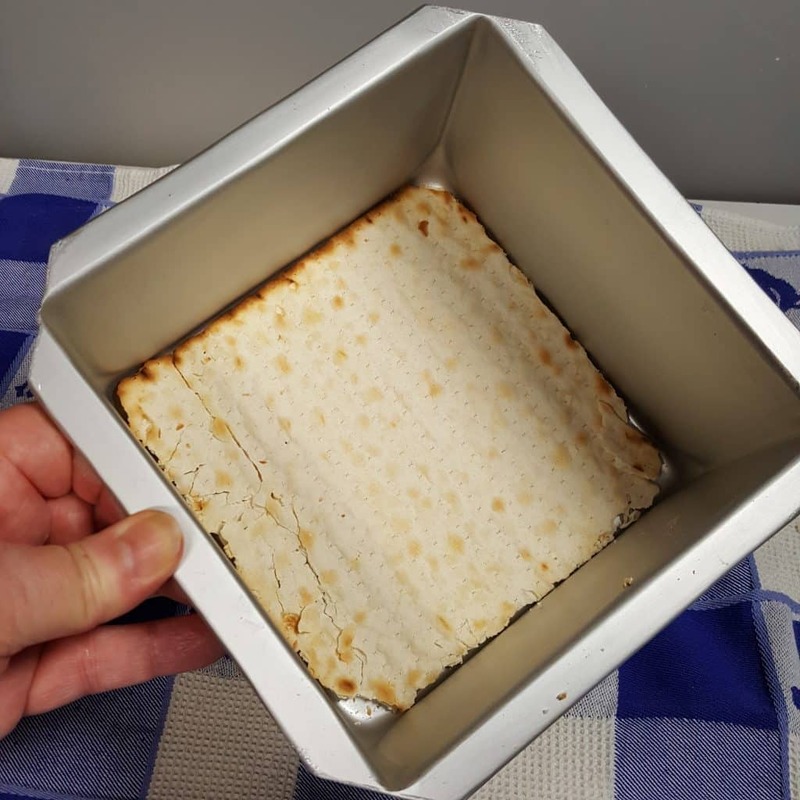 It is fine if the Matzo breaks. You can make this in a Round 7 Inch Cheesecake Pan if you like. Just break up the Matzo and lay it into the Pan. If it fine if it overlaps. That will make a larger amount, so plan accordingly by making 1.5 of the Recipe. 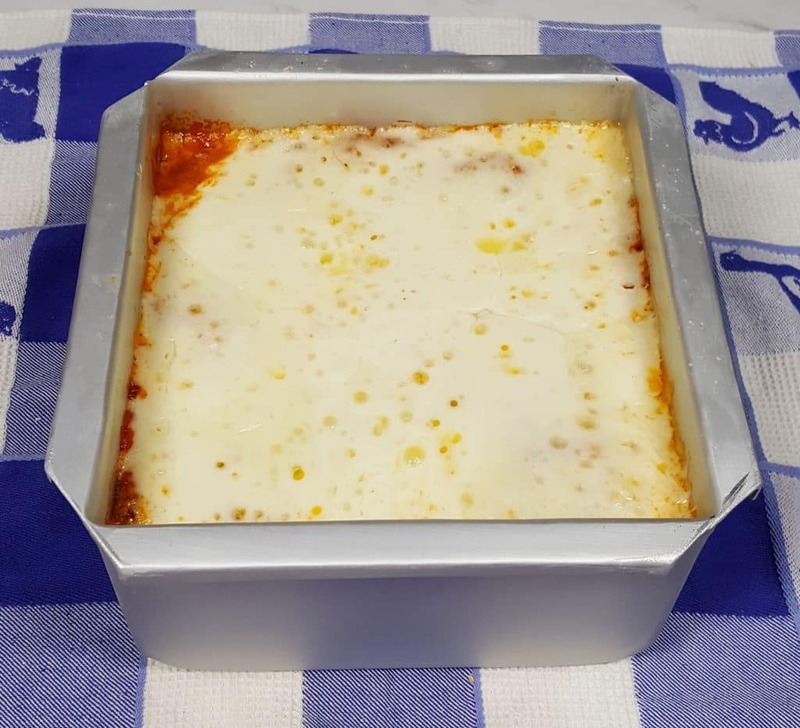 Standard assembly – Cheese Filling, Mozzarella, Veggie Layer and Sauce. Add another Matzo and repeat until the Lasagna Pan is full. I used a 6 Inch Lasagna Pan and sawed off the corners to make it fit into my 8 Quart Pressure Cooker. The 5 Inch Lasagna Pan will fit into a 6 Quart Pressure Cooker. If you can find a pan without a lip, that would work well. Three inches tall is great, for a taller Lasagna. I like a Square Pan, but using a round is fine. After the last layer of Pasta Sauce, add a generous layer of Grated Parmesan Cheese. I know some of you will ask if you can use the stuff in the green tub. Sure, if you like. You can also mix that into the Cheese Filling, rather than using the Freshly Grated. 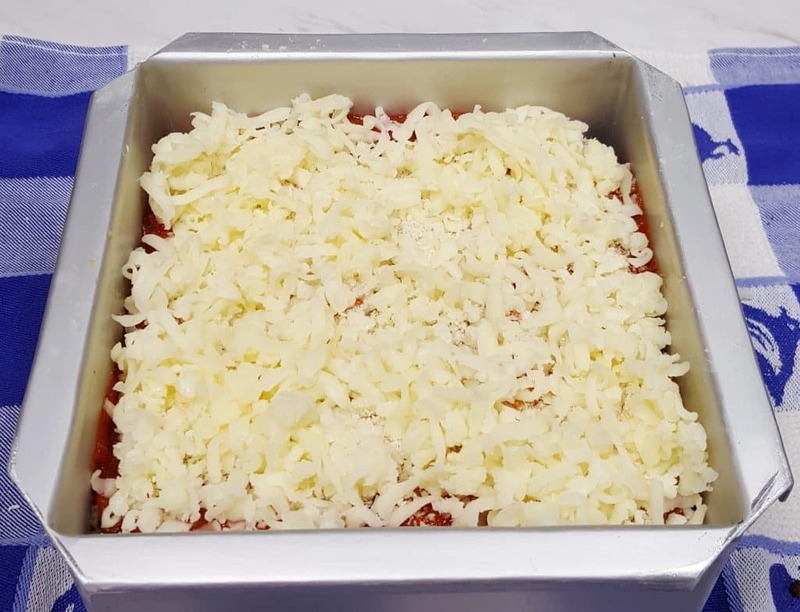 Add the remainder of the Mozzarella Cheese and you are ready to bake. Make sure you remember to add Water to your Pressure Cooker cooking pot and then place a Short Legged Trivet. No need to cover the Lasagna Pan. We want to make sure the Matzo will become nicely moist. 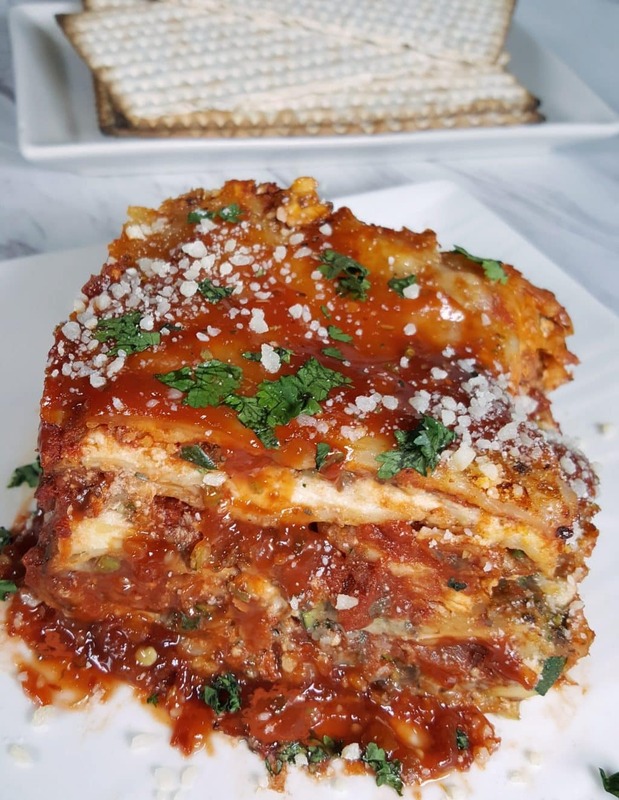 The Pressure Cooker Passover Vegetable Matzo Lasagna looks delicious, right out of the Pressure Cooker and is ready to serve. 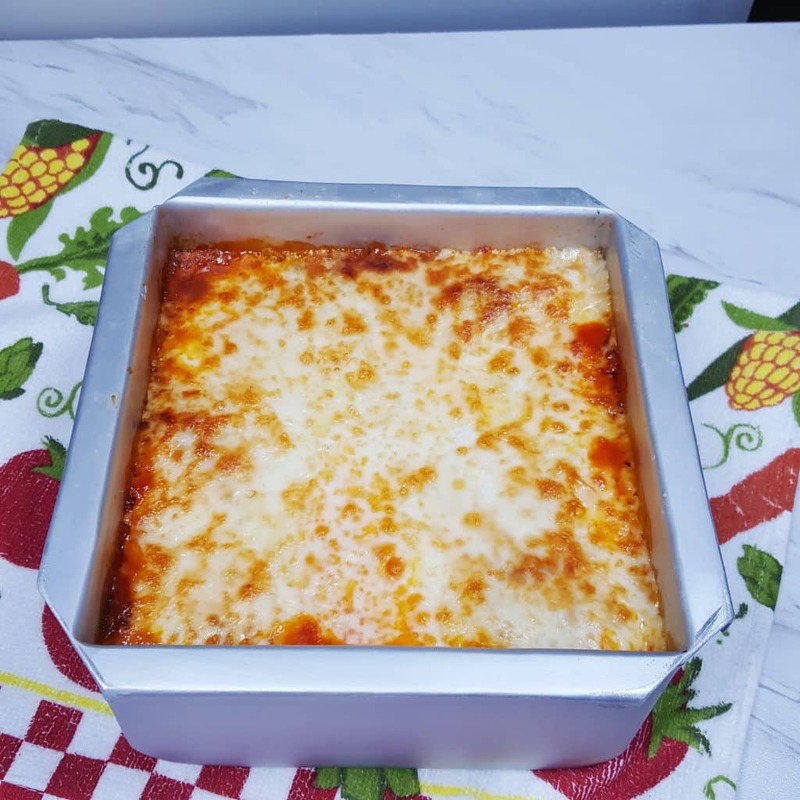 Truth be told, I prefer a Vegetarian Lasagna over a Meat Lasagna, so be on the lookout for my Traditional Pressure Cooker Vegetarian Lasagna (with a meat option for those who like a meat Lasagna). 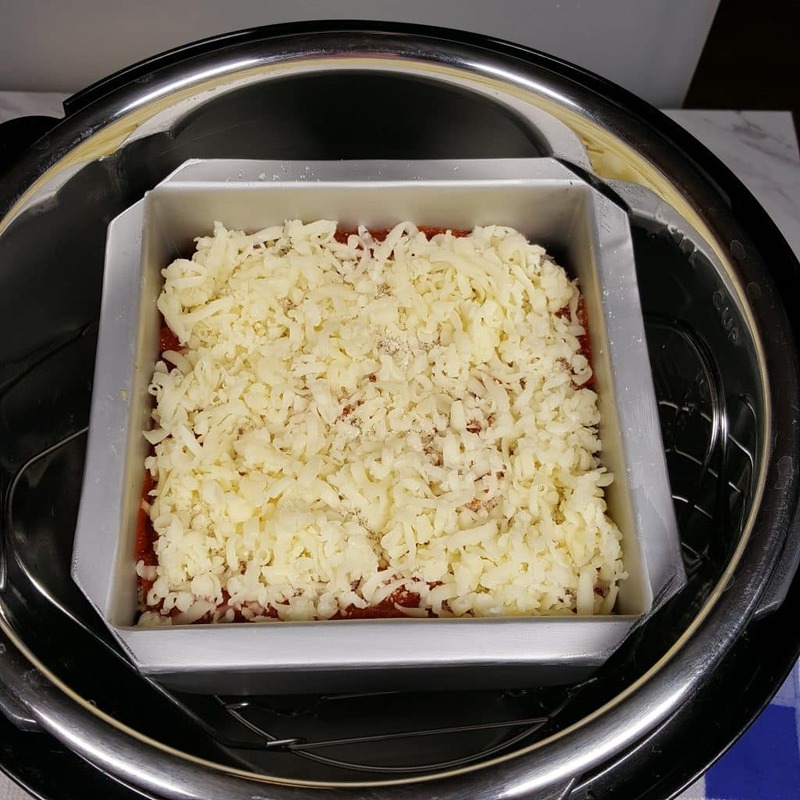 If you want to add some color to the Cheese, place the Pan of Lasagna into the Air Fryer, or under the Broiler, until brown and bubbly. I used my Air Fryer as it gives me very even browning and nice color, without burning. Top with more Pasta Sauce and Grated Cheese. Tell me this doesn’t look delicious!!! Even my very picky, ‘meat with pasta loving, where’s the meat,’ husband (and you have heard all about that), loved this Lasagna. He won’t eat Zucchini, unless fried (check my Air Fryer Zucchini Zircles recipe!). He complained and I said, pull out the chunks. Guess what? He cleaned his plate and asked for seconds. Talk about being floored. I said, you ate the Zucchini? He said, there wasn’t much. Ahh, yeah, there was, you ate 1/4 of a big Zucchini. Shall I make this again. YES! Another meal to enjoy during Passover is my Pressure Cooker Friday Night Shabbos Brisket and if you eat rice during Passover, my Pressure Cooker Jewish Sweet and Sour Stuffed Cabbage is super delicious. Saute Mushrooms for 5 minutes in a skillet with butter, Worcestershire and Shoaxing/Sherry Wine. Remove to food processor. Process for 10 seconds. Add chopped zucchini and process for 5 seconds. Mix together Cheese filling ingredients. Place one piece of Matzo into Lasagna Pan. Add 1/3 Cheese Filling, 4 oz shredded Mozzarella Cheese and 1/3 Mushroom Mince. Top with 1/2 cup Pasta Sauce. Repeat two more times. Sprinkle 1/4 cup Parmesan Cheese over Sauce and the rest of the Mozzarella Cheese. Add 1.5 cups of water to Pressure Cooker cooking pot. Place Trivet in cooking pot. Place pan of Lasagna on Trivet. Lock on Lid and close Pressure Valve. Cook at High Pressure for 12 minutes. Allow a 5 minute (or more) Natural Pressure Release. Slice and Serve. Top with more Pasta Sauce and Parmesan Cheese, if desired. PIN this Pressure Cooker Passover Vegetable Matzo Lasagna! This looks lovely, Jill! I’ve never heard of using matzo for lasagna. What a great idea. I’m going to give this recipe a try even though I don’t have any dietary restrictions!